Ground flaxseed is a good supporting player in a weight loss diet. It provides fiber, which helps you feel full and offers other weight-loss benefits. It's also one of the top sources of omega-3 fatty acids and lignan, which may facilitate your effort to drop excess pounds. With only 37 calories in 1 tablespoon, flaxseed is easy to include in your diet without breaking the calorie budget. You can also cut calories when you cook by replacing fats and eggs with ground flaxseed. Substances in flaxseed may interact with some health conditions, so consult your healthcare provider before adding them to your diet. Dietary fiber is an important weight-loss nutrient and as little as 1 tablespoon of ground flaxseed -- containing 2 grams of fiber -- may give you enough to make a difference. In a very small study reported in the journal Appetite in 2012, a drink containing 2.5 grams of flaxseed fiber helped suppress appetite and caused subjects to eat less. Dietary fiber adds bulk that fills your stomach. As a result, you feel full sooner and satiety lasts longer, which makes it easier to eat less food. The soluble fiber in flaxseed slows digestion and prevents glucose from spiking blood sugar. Balanced blood sugar helps you lose weight because any excess sugar is stored as fat. High blood sugar has another negative effect on weight loss. It triggers the release of insulin, which tells the body to stop breaking down stored fat. This means you won’t burn excess fat for energy. The soluble fiber in flaxseed is fermented by bacteria in the colon which increases good bacteria and may help with weight loss. A small study, published in the British Journal of Nutrition in April 2015, reported that insulin sensitivity improved in overweight postmenopausal women when they consumed flaxseed. Insulin resistance is a pre-diabetic condition in which the body no longer responds to insulin in a normal fashion. If you’re insulin resistant, improving insulin sensitivity will help you lose weight. Ground flaxseed contains alpha-linolenic acid, or ALA, which is an essential omega-3 fatty acid. The body converts some of the dietary ALA you consume into eicosapentaenoic acid, or EPA, and docosahexaenoic acid, DHA. The omega-3s EPA and DHA are responsible for lowering the risk of cardiovascular disease. Getting a sufficient amount of omega-3s may help prevent obesity, reported the European Journal of Clinical Nutrition in 2013. One way omega-3s keep weight down is by boosting levels of adiponectin, which is a hormone produced by fat cells that regulates the metabolism of lipids and glucose. A deficiency of adiponectin may contribute to insulin resistance, coronary heart disease and nonalcoholic fatty liver disease. 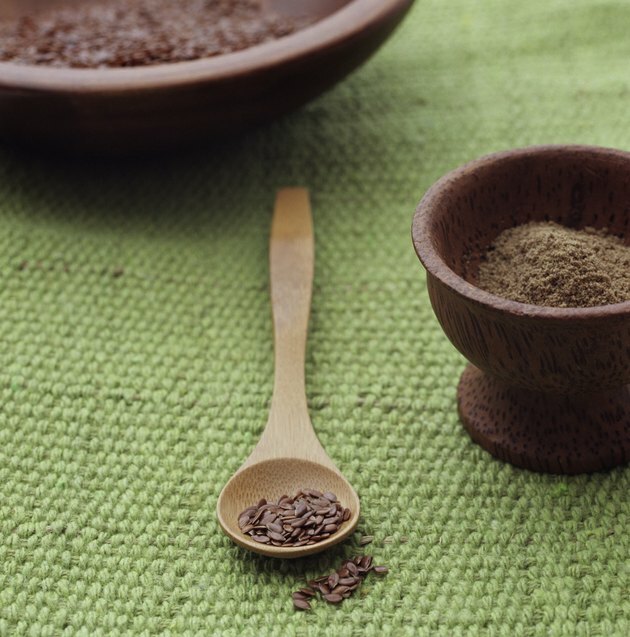 You’ll get 1.6 grams of ALA from 1 tablespoon of ground flaxseed, which is 100 percent of men’s daily intake and more than the 1.1 grams recommended for women. Only two foods are significant sources of lignans -- flaxseeds and sesame seeds -- and flaxseeds have nearly eight times more lignans than sesame seeds. Lignans are called plant phytoestrogens because bacteria in the intestine convert them into enterolignans, which subsequently exert a mild estrogenic effect in your body. Lignans may help prevent cardiovascular disease by lowering cholesterol. They use their antioxidant action to fight inflammation and slow down cancer growth, but more research is needed to verify their effectiveness, according to a report in the British Journal of Nutrition in 2010. Even though research has not directly connected lignans to weight loss, the 2010 report noted that they may protect against metabolic syndrome by lowering blood levels of lipids and glucose. Their potential to reduce glucose may help you lose weight, as long as total calorie intake stays below the calories used for energy. Flaxseeds are generally considered safe for most people, but MedlinePlus has issued safety warnings because of their active ingredients. They can have a laxative effect and cause related side effects such as diarrhea, gas and abdominal pain. Pregnant women should avoid ground flaxseeds because of their phytoestrogens. If you have diabetes, a bleeding disorder, a bowel obstruction, hormone-sensitive cancer or any chronic health problem, talk to your doctor before consuming flaxseeds. Keep ground flaxseeds refrigerated and use them within 24 hours after grinding because the ingredients will begin to lose their potency. You can replace up to 15 percent of the flour in recipes with ground flax, but you may need to increase the yeast, suggests AmeriFlax. Flaxseeds can cut calories in recipes if you use them as a substitute for eggs and fats. Use 3 tablespoons of ground flaxseed to replace 1 tablespoon of margarine, and mix 1 tablespoon of ground flaxseed with 3 tablespoons of liquid to replace each egg. Boost the fiber and get more ground flaxseed into your diet by adding it to whole-wheat pancakes or muffins, oatmeal, yogurt or tuna salad.